Coats Corus is the special thread made of slightly waxed polyester fiber. Thanks to the small content of wax, Coats Corus the most suitable for sewing of soft leather products or sports shoes (for example, from nubuck). Such thread can be also used as the main line or a decorative thread at difficult operations of sewing, for example, for jeans, leather products, boots and footwear. Coats Corus guarantees the best productivity of doppel-cars, for example, of Blake and Rapid. Coats Brio is the cord processed by greasing from complex polyester fiber for machine sewing; is the excellent choice for high-speed production of finishing and decorative seams on footwear and products from skin. Coats Match is the slightly waxed, wattled thread from polyester fiber used by special cars for tailoring of moccasins and other footwear from delicate skin. These types of colourfastness represent minimum levels of productivity. For special requirements to colourfastness, it is necessary to make a reference to Technical Services. 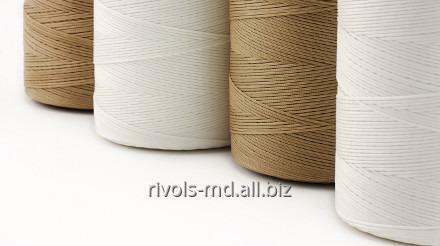 Unbelievable price on Cord from complex PE of fiber for tailoring of products from soft skin, footwear and Coats Corus jeans in Chişinău (Moldova) company Rivols, SRL.